The end of August marked the completion of a six-week run of sold-out performances of Shahrazad, A Tale of Love and Magic at Double Edge Theatre. 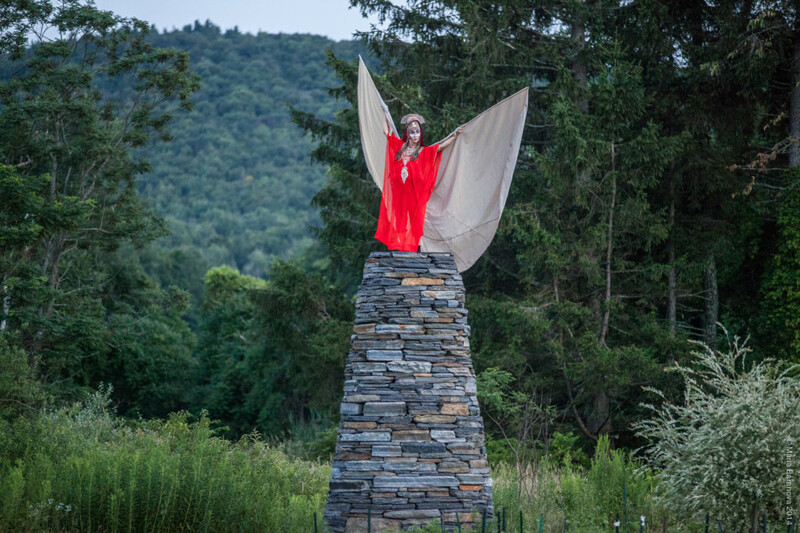 Under the conception and direction of founder Stacy Klein, Shahrazad guides audiences from the mythical landscapes of the Arabian Nights and Song of Songs through the actual fields, barns, and gardens of a former western Massachusetts dairy farm. These 105 acres set the stage for a woman’s journey to transform her world and save her own life through the stories she tells. Through writer Matthew Glassman’s weaving of texts from Arabian Nights, Song of Songs, Rumi, and Conference of the Birds, Shahrazad invites audiences to journey alongside King Shahrayar through place and story. 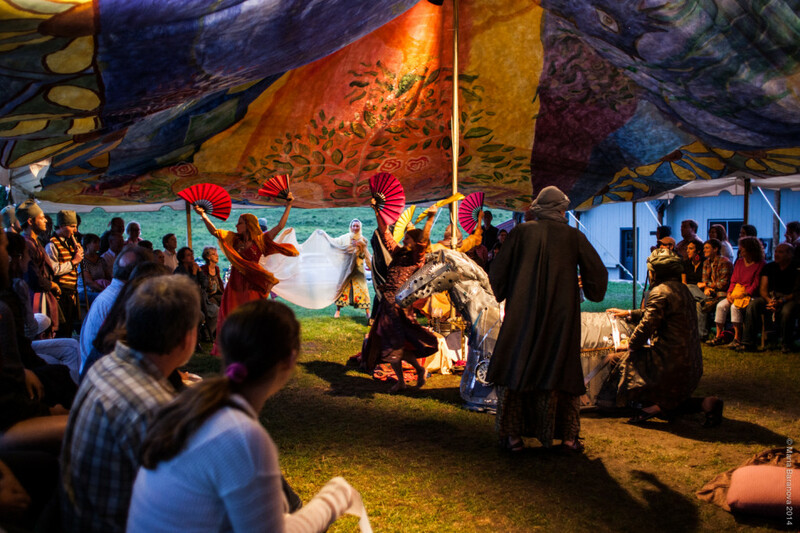 Presented in association with a remarkable group of local and international artists, the performance incorporates site-specific installations and original compositions with North African, Middle Eastern, and Indian influences alongside physical, acrobatic performances that conjure flying genies, a giant hoopoe bird, and castles of illusion. The setting makes this production unlike any other. As dusk extends long shadows from pines that mark the boundary between ground and sky, oud and violin accompany the rising voices of the harem who are invoking the rich smell of herbs under the rhythm of the pestle. 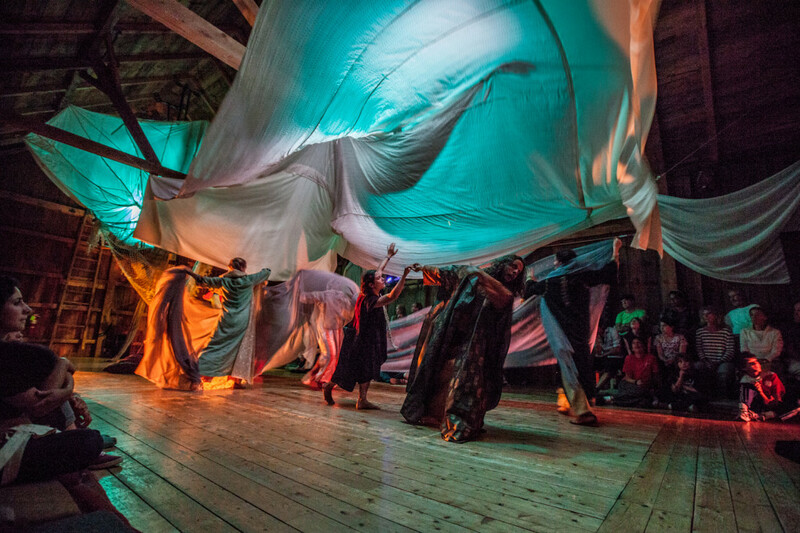 “A night pregnant with the scent of stories” unravels as the audience is guided through the farm while the swimming, dancing, flying cast- demonstrating their intimate understanding of this place- moves in perfect step with the landscape. At times, there is no separation of audience to performer, or stage to countryside: coyotes call in the distance, cows get after one another, thunderstorms descend. 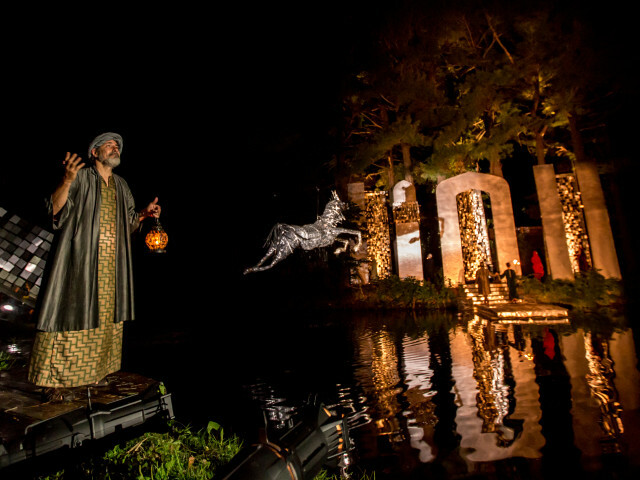 By the time the Milky Way reflects into the pond during the final scene, it is clear to us that the land, audience, and performers are interacting to create an intentional immersion experience that is unique to each evening’s performance. Double Edge is internationally acclaimed as a preeminent laboratory theatre, and the Summer Spectacle evidences their commitment to research: The shows evolve daily through trainings and rehearsals and shared meals. Daily training- which they describe as a “holistic methodology that employs physical, vocal, emotional, and imaginative through physical training, improvisation, and etudes”- reminded me of something akin to ecstatic religious practice. Training and working on the farm seem to steward the ensemble’s reverence for the place and its presence in their practice. This year Double Edge Theatre celebrated its 20th anniversary in Ashfield, Massachusetts (Population 1800). Within Pioneer Valley along the border of the Berkshires, Ashfield was historically a dairy farming community. Like much of New England, Franklin County faced a considerable economic transition in the 1980s and 1990s as Big Ag consumed the dairy industry and expanded westward. Ashfield’s dozens of generational family farms reduced to two. Franklin County displays a jarring contrast as generational hill-country families neighbor the seasonal homes of urbanites; Still, the region is persistent in its traditions of neighborliness. The town’s distinct history of tolerance and direct governance continues to gather the community in town hall meetings and town greens, and supports an impressive array of local businesses, organic farms, and artisans. Double Edge sought a laboratory space as it moved from Boston to Ashfield, but has evolved over the past two decades from a place to work to a place to live and connect to the community. Open trainings, in-school programs, collaborations with local artists and businesses, and the Summer Spectacle each connect the theatre to the community. The Double Edge Student Immersion program began in 1993 and the Summer Spectacle in 2002. These programs, along with an indoor Garden Cycle season, allowed Double Edge to not only cultivate a second generation of theatre makers, artists, and community organizers- but contributed to growing a committed local audience invested in the work and the farm. This cycle of work has helped the company to teach the Double Edge language, which has even been reconstituted through a production with the local elementary school who, at the suggestion of a student, transformed the school play by “doing it the way that Double Edge does.” Thirteen years into the Summer Spectacle tradition the theatre attracts almost 3000 people per Summer to Ashfield, which demonstrates the effectiveness of long term investment in creative placemaking in a rural context. Double Edge Theatre’s model- described as creating both intrinsic and extrinsic impact through job creation, revenue streams, and deep cultural and social resonance in the community- has been the subject of an impact study by Williams College. This economic impact also makes sense to the people of Franklin County, who have come to understand Double Edge as good neighbors and as stewards of the land and community. Through this unique laboratory of theatre, land, and community, Double Edge also stewards new developments and understandings of this kind of work in the rural arts field. 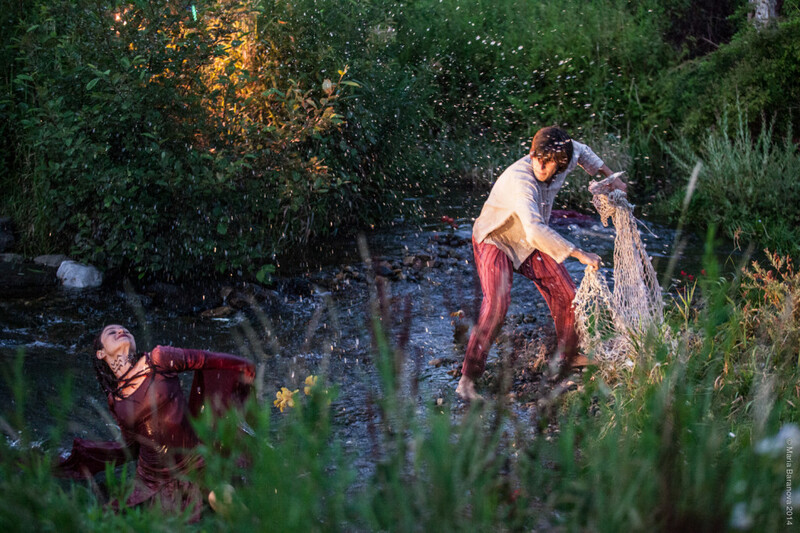 In 2015, Double Edge will embark on the planning and development of the Spectacle Tour, engaging with rural populations throughout the world on the creation and production of The Odyssey in their hometowns. International programs for the Spectacle Tour currently include the Fredriksten Music Festival (Norway) in May – June 2015 and the Argentina National Festival in 2015/16. 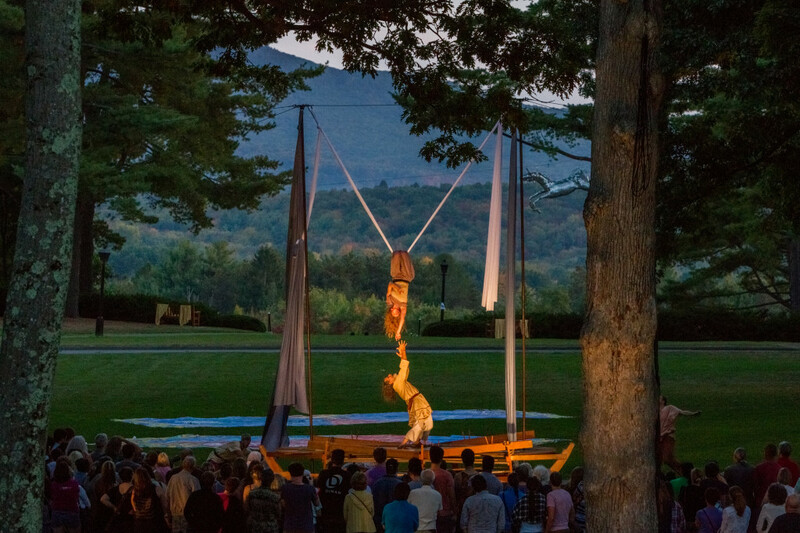 Double Edge also recently created and performed a Spectacle at Amherst College, a combination of three previous works, Shahrazad, Odyssey, and Don Quixote, which took audience from the library steps of the Amherst quad to the cliff overlooking the Pioneer Valley. Double Edge performing a Spectacle at Amherst College, Photo Credit Rob Mattson. Art of the Rural recently completed a Year of the Rural Arts Residency at Double Edge Theatre. To learn more about Double Edge Theatre, please visit: http://www.doubleedgetheatre.org/. Please check out the Summer Spectacle story on the Atlas of Rural Arts and Culture, and report back to us at Art of the Rural to tell us about your experience! Please use the social media hash tag #ruralarts in any social media posts from the event. THE YEAR OF THE RURAL ARTS is a biennial program of events, conversations, and online features celebrating the diverse, vital ways in which rural arts and culture contribute to American life. The Year is coordinated by Art of the Rural and organized by a collective of individuals, organizations, and communities from rural and urban locales across the nation. The inaugural Year is a collaborative, grassroots effort designed to build steam over the course of 2014. To present a more equitable representation and a more comprehensive narrative of rural arts in culture, all online features will be freely shared across websites and social media. For more information on the Year of the Rural Arts, visit: www.artoftherural.org.